The feast of the Annunciation marks the visit of the angel Gabriel to the Virgin Mary, during which he told her that she would be the mother of Jesus, the song of God. Here is what you should know about the Annunciation. What does the Annunciation mean? The word ‘annunciation’ comes from the word announce. The angel Gabriel is announcing the birth of Jesus Christ. When is the Annunciation celebrated? 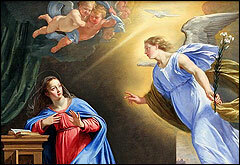 The Annunciation is a solemnity (a celebration of great importance), and is celebrated on March 25th. This occurs nine months before Christmas, the typical length of a pregnancy. If March 25th happens to fall during Holy Week, then the Feast of the Annunciation is transferred to the Monday after the second Sunday of Easter. What is similar about this story to the story of John the Baptist? The person who Gabriel to whom announces the birth to has an important place in God’s plan. How is Mary’s reaction different to Zechariah’s? When Mary questions Gabriel, it might seem like she doesn’t believe him. But unlike Zechariah, Mary doesn’t ask how she could know what the angel is saying will be true, she is asking how it will be fulfilled. She is showing that her faith is seeking understanding, not that she has a lack of faith. Mary indicates to Gabriel that she is a virgin. Of course this means that according to the laws of nature, Mary could not possibly be pregnant. Scholars believe that the fact that Mary asked this question and referred to her virginity should be taken as a sign that Mary did not plan to have an ordinary marriage, in which she would have sexual relations with her husband. How does Gabriel respond to Mary’s question? Gabriel tells Mary, ‘The Holy Spirit will come on you, and God’s power will rest upon you.’ With this statement, Gabriel is referring to the three persons of the Holy Trinity. Through the action of the Holy Spirit, the Father causes the Son to be conceived in human form. This makes it clear that Jesus will be the Son of God. There is actually no word for cousin in Aramaic. So despite the well-known translation that Elizabeth was Mary’s cousin, the Greek word used to describe their relationship is more correctly translated as ‘female relative’. Elizabeth may not have been a cousin in particular. Why is it important that Mary said ‘Yes’? Mary’s acceptance of this role is momentous! She will be the Mother of God himself. But accepting this role also means that Mary will be regarded as being unfaithful to Joseph. That would involve public shame. Yet, despite this, she places herself completely at the service of God’s will. Mary demonstrates a free, humble and yet magnanimous obedience to God.